1 of 4 In a small bowl, whisk together soy sauce, honey, hoisin, garlic, ginger and five-spice powder. Place in a resealable plastic bag and add pork; shake to coat. Refrigerate overnight. 2 of 4 Coat slow cooker bowl with nonstick cooking spray. Place pork in bowl and pour marinade over top. Cover and cook on HIGH for 4 hours or LOW for 6 hours. 3 of 4 Remove pork to a large baking dish and keep warm. Pour liquid from slow cooker into a saucepan. In a small bowl, stir cornstarch into broth. Bring liquid in saucepan to a boil and whisk in the broth mixture. Cook for 1 minute. 4 of 4 Shred pork into large pieces with two forks; stir in sauce. 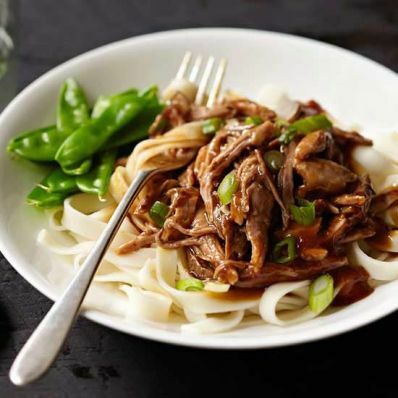 Spoon over noodles; garnish with scallions and serve with steamed snow peas, if desired. Per Serving: 741 mg sodium, 95 mg chol., 8 g Fat, total, 3 g sat. fat, 485 kcal cal., 65 g carb., 39 g pro.